Smart cities, which apply the new generation information technology in all of urban construction, could promote the efficiency of urban infrastructure and services greatly. They also support the sustainable development of economy and encourage participatory governance through the elaboration management of nature resource, social capital and intellectual capital, so as to realize the high quality of urban life. 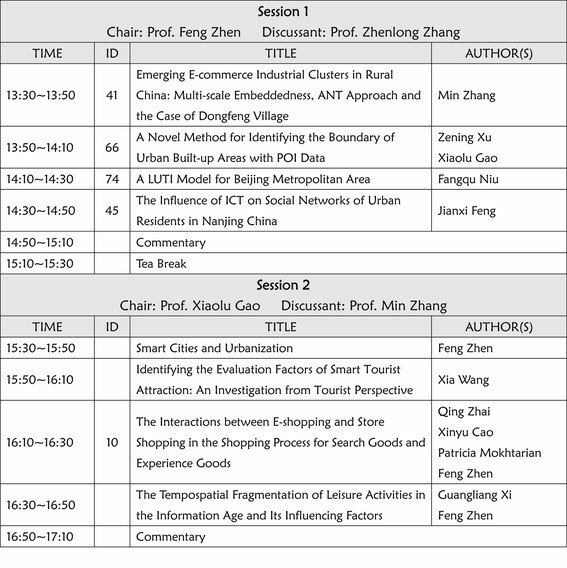 In China, smart cities and the development of new urbanization have become the national strategies. The construction of smart cities is also thought as a proposed method to accelerate new urbanization, and the way to sustainable development. So, the panel will focus on discuss the role of smart cities (ICTs) on sustainability, the relationship between ICTs and human behaviours, urban planning and design under the background of smart cities, etc.